Prior to starting his own company, Charles Gersbach sought advice from a number of Duke BME faculty entrepreneurs on the best way to get started. But what he learned was surprising. When he first started at Duke in 2009, Gersbach wasn’t focused on entrepreneurial work. But as he began to win grants and publish research in the field of genome editing and genome engineering, it drew the attention of several pharmaceutical companies who wanted to use his technology for improved drug development. “I was working on characterizing the non-coding genome, which is essentially the 98 percent of our genome that we don’t fully understand, and there was evidence that it plays a large role in drug response and disease susceptibility. In August of 2015, Gersbach approached Barry Myers in the Duke-Coulter Translational Partnership, which had supported Gersbach’s research at Duke, for help to form a startup. Within 48 hours, Gersbach and his collaborators Tim Reddy and Gregory Crawford had formed Element Genomics, Inc. The team received further support from Duke in the form of John Oxaal, who was then working as the Entrepreneur-in-Residence at Duke BME. Oxaal, an alumnus of Duke Engineering and a serial entrepreneur himself, worked with the team to finalize licenses and find space in an incubator in Durham, eventually serving as CEO of the company. 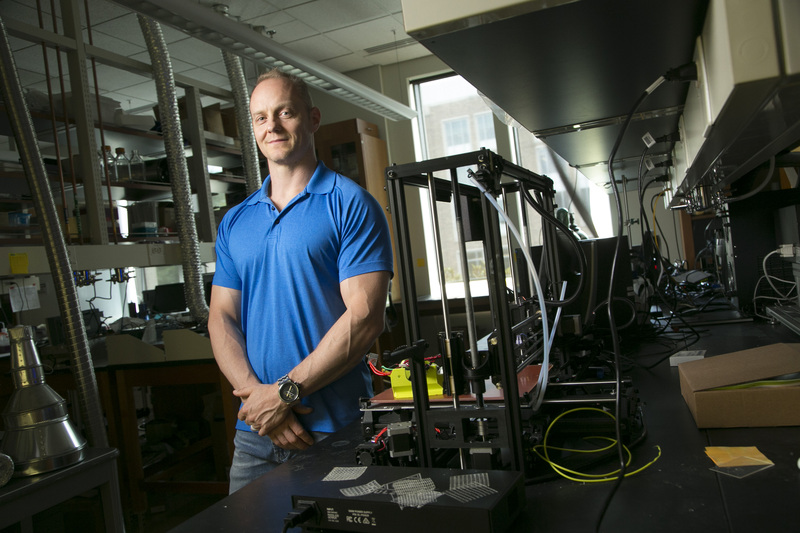 Michael Lynch was a postdoctoral researcher at the University of Colorado when he founded his first company, OPX Biotechnologies, in 2007, but he soon threw himself into working full-time to build the startup’s footprint in functional genomics technology. But prior to the company’s acquisition in 2015, Lynch decided to return to his academic roots. 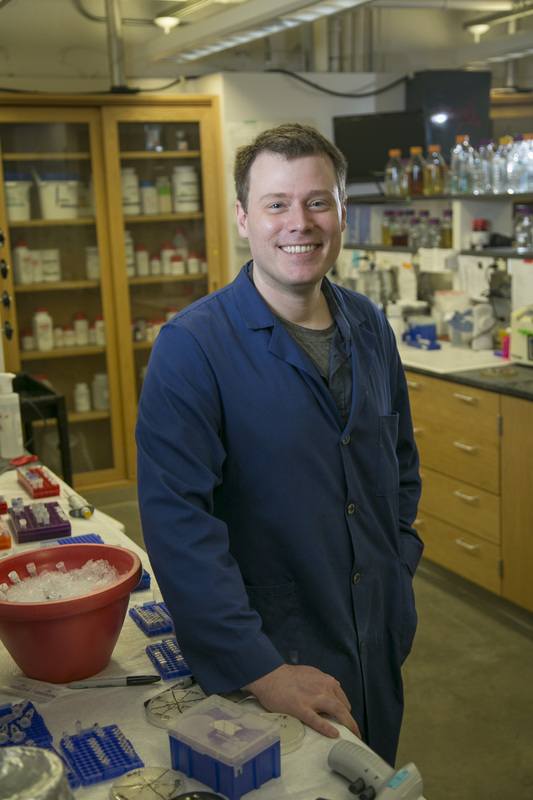 By November of 2014, he was working as an assistant professor in Duke University’s Department of Biomedical Engineering, drawing upon his expertise in genomics to engineer microbes to produce useful chemicals. It wasn’t long before Lynch founded DMC, based on a novel process that will allow researchers to scale up and streamline the production of molecules used in flavors, fragrances, agricultural chemicals and other commercial products. Lynch’s entrepreneurial perspective extends beyond his business. In his Duke BME design classes, he encourages students to think strategically about the needs of the marketplace and a product’s value to a customer when developing their own technology. His lab will also become more entrepreneurial when it moves next to BRiDGE, a space in the Chesterfield building in downtown Durham for Duke BME students and faculty to grow new startups and ideas. “Coming back to academia has allowed me to pursue riskier ideas, and even if it doesn’t pay off I get to learn something new,” says Lynch. For Warren Grill, running a small business isn’t much different than running a research lab—and he’s had plenty of experience doing both. In 2002, Grill founded NDI Medical based on technology his lab had developed to use electrical stimulation to treat overactive bladder. Grill and his partners sold the company to Medtronic in 2008, but by the next day they had launched their next company, also called NDI Medical. The second generation of NDI quickly became an incubator, where Grill and his collaborators hunted for “medium-rare ideas” in electrical stimulation systems that they could develop into products. To further their efforts, the team also started the NDI Healthcare Fund, a small venture fund that raised money to support the incubator. Three companies were eventually ‘hatched’ from the incubator. The first, Checkpoint Surgical, currently sells two FDA-approved products, including a hand-held, disposable intraoperative stimulator that surgeons use to identify and protect nerves in the surgical field. The second is SPR Therapeutics, which develops devices to relieve chronic pain. Its main product is the Sprint, which recently received FDA approval and includes an electrode that goes through the skin and delivers electrical stimulation over the course of several weeks to achieve durable pain relief. Grill co-founded and acts as the CTO of the third company, Deep Brain Innovations, or DBI. Based on intellectual property developed in his Duke lab, the company is improving the efficacy of deep brain stimulation by changing the temporal pattern of stimulation, or the timing between pulses, so it requires less energy, provides superior symptom relief and the implant lasts longer. Nimmi Ramanujam founded Zenalux Biomedical to make it easier for cancer researchers to perform real-time, non-destructive analysis of biological tissue and tumors. 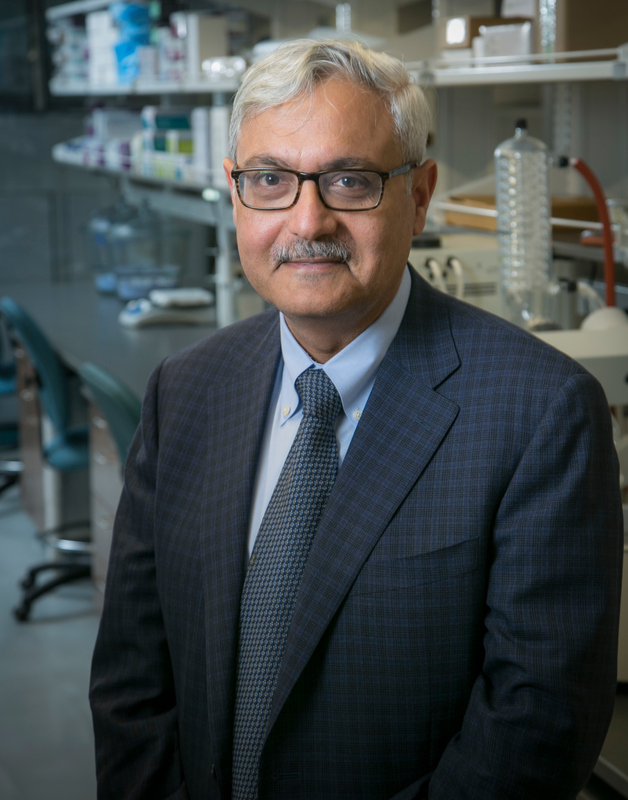 Based on novel technology Ramanujam developed while a professor at the University of Wisconsin–Madison, and launched with support from the Duke-Coulter Translational Partnership, Zenalux is one part of Ramanujam’s larger goal to improve cancer therapy. The company’s flagship tool is the Zenascope, a visible spectroscopy device that rapidly measures biomarkers, like tissue oxygenation levels, without the need to biopsy tissue. This technology allows doctors and scientists providing patient care and conducting cancer research to characterize key cancer hallmarks that differentiate aggressive from indolent disease. Using the Zenascope, researchers can also examine the effectiveness of therapy by monitoring changes in the tumor microenvironment. Zenalux is currently working on head and neck cancer diagnostics and treatment. The company successfully implemented pressure sensing and automated self-calibration, in addition to customization of several probe designs for the diagnosis of clinical head and neck tumors in collaboration with Dr. Walter Lee at Duke University Medical Center. Further supporting the market focus on head and neck cancer, Zenalux has worked with Roswell Park Cancer Institute, University of Minnesota and the University of Rochester on a multi-site study to guide photodynamic therapy (PDT) for head and neck cancer. A newer version of the Zenascope measures additional hallmarks related to tumor metabolism—specifically, glycolysis and mitochondrial metabolism such that both the vascular biology and metabolism can all be measured with one system. 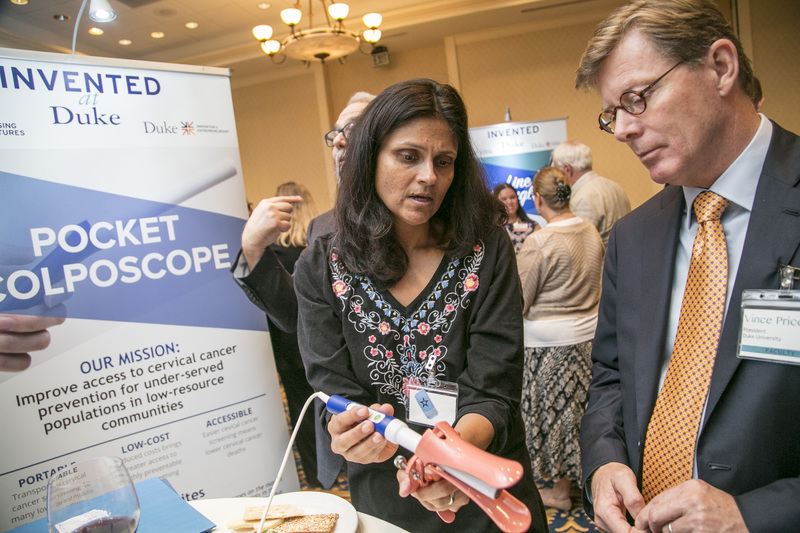 Ramanujam is also introducing entrepreneurial work in global health to students at Duke on the latest product her team has developed, the Pocket Colposcope, a low cost cervical cancer-screening device. Through her Bass Connections course (currently in year 2), students traveled to Lima, Peru to engage stakeholders to identify strategies for adoption of the Pocket Colposcope in the community setting to improve access to early screening. Additionally, she has created a post baccalaureate program in which fellows work with industry partners on product development and regulatory activities. Hadleigh Health Technologies in San Rafael, California, will commercialize the Pocket Colposcope for global cervical cancer screening. Since 2002, Ashutosh Chilkoti has founded five companies based on research from his lab at Duke University, ranging from drug delivery to diagnostics—a string of companies he never would have anticipated at the outset of his academic career. he discovered a new way to purify and capture proteins and deliver drugs using elastin-like polypeptides, or ELPs. Today, the company develops ELP fusions to improve the stability, bioavailability, activity and ease of administration of proteins and peptides to achieve greater potency, reduce side effects, and improve patient compliance. So far, PhaseBio has launched and completed multiple clinical trials of ELPs for use in the treatment of diabetes and heart disease. In 2012, Chilkoti and Angus Hucknall, then a graduate student working on his PhD with Chilkoti, founded Sentilus, based on a unique nonfouling polymer brush developed in Chilkoti’s lab. The polymer coating acts like Teflon to prevent non-target protein analytes from sticking to a surface, essentially eliminating background noise in sandwich immunoassays. In a streamlined tech-transfer deal, Sentilus was acquired by Immucor in 2014. Shortly after, Immucor returned all fields of use of the technology outside of human in vitro diagnostics. Chilkoti and Hucknall then co-founded BioStealth to develop and commercialize the nonfouling coating technology for other areas of interest, including research diagnostics and tools, veterinary diagnostics, and biomaterials. Now, Chilkoti has two additional startups moving into the new BRiDGE incubator in the Chesterfield building in downtown Durham. GatewayBio, again founded with Angus Hucknall, will focus on the next generation of polymer conjugates of protein and peptide drugs that improve their efficacy. Isolere Bio will develop technology to purify monoclonal antibodies for therapeutics. 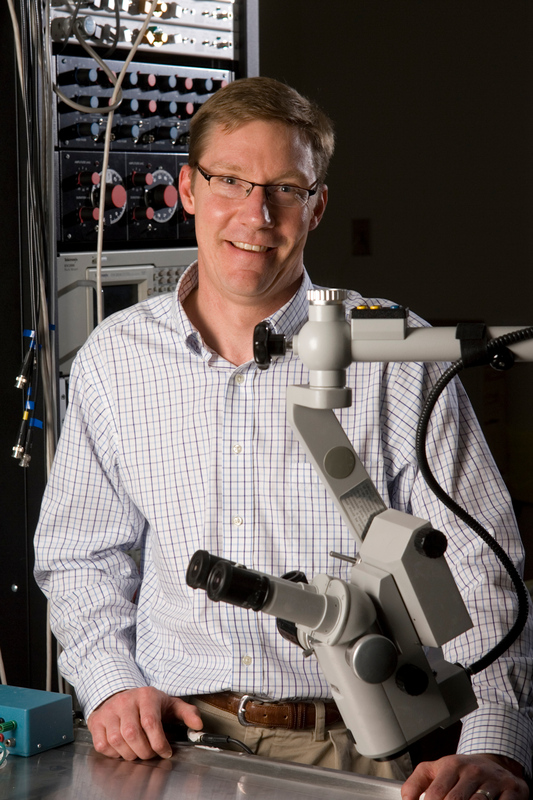 Ken Gall, the chair of Duke University’s Department of Mechanical Engineering and Materials Science and a secondary faculty member in BME, founded Vertera Spine in 2013 after his team discovered a new way to create a high strength spinal implant from a porous polymer. 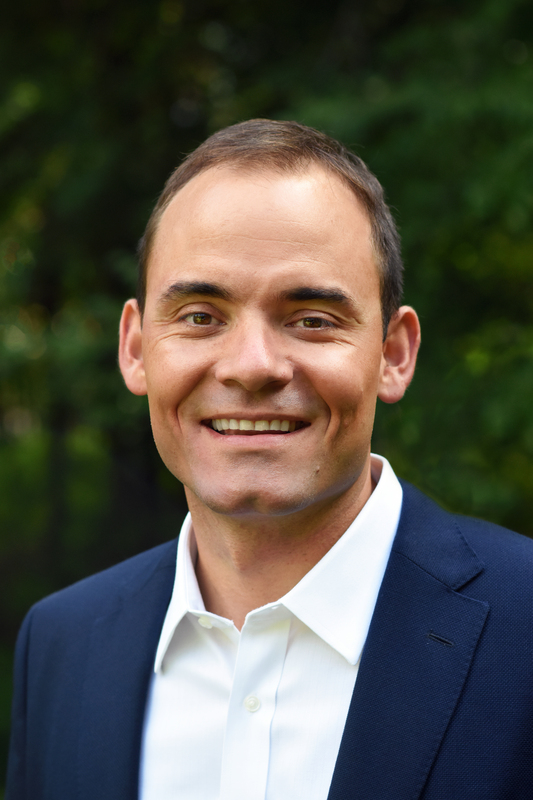 When Gall moved to Duke from the Georgia Institute of Technology in 2015, he continued to grow the company with support from both schools, leading to a successful and highly collaborative startup. (polyether ether ketone), a high-strength biopolymer that allows for better bone attachment and repair following spinal surgery. Gall and his team invented a way to form a highly porous, interconnected network on the polymer’s surface without adding or subtracting material and without negatively impacting the mechanical properties of the material. During lumbar or cervical spinal fusion procedures, physicians insert a spinal cage implant between vertebrae to provide stability and support while the segments fuse. More than three-quarters of the spinal market uses PEEK technology for implants, but porous spinal cages were only available in metals, which do not show up as well in medical imaging. In the four years since its inception, the company has already progressed through significant milestones. In 2015, the team published their first paper on porous PEEK and the implant was approved by the Food and Drug Administration. The following year, the technology was clinically introduced when Vertera launched its COHERE implant, which has subsequently been used in more than 2,000 successful spinal surgeries. But the most significant change for the company occurred in September of 2017, when Vertera was acquired by NuVasive, Inc., a leading medical device company with a focus on spinal surgery. & Entrepreneurship Initiative (I&E) to help Duke startups grow by facilitating the flow of capital and support from Duke-affiliated angel investors. “The Duke I&E and the Duke Angel Network have provided us with capital investment and key guidance during the last two years of Vertera’s growth into the market,” says Gall. “We are extremely fortunate at Duke to have this incredible resource for faculty, students and alumni entrepreneurs.